This project was executed over the final eight-week segment of the spring semester of second year. The largest and most complete architectural project that the students had executed to this point, the project was sited on the same site and reapplied the site research as the Masonry Pavilion previously outlined. 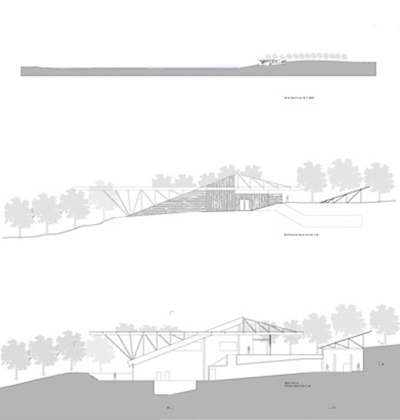 In order to capitalize on the site, Frank Liske Park outside of Harrisburg, North Carolina, the students further explored the phenomenological aspects of the site, its topography and the natural conditions of the area in order to site the moderately sized building. The design was first explored through a matrix of sketch models that investigated a variety of simple design concepts. These models evolved to house the 25m x 10m pool which was the central focus of the design. The relatively complex program presented the students with an intricate circulation diagramming exercise as they needed to clearly articulate with how the pool users and the general public would move throughout the building. The Natatorium exercise proved to be a challenging but fitting exercise for the students as they investigated public / private relationships, long-span structures, site analysis, circulation, accessibility and enclosure jointly for the first time.